Ok, well Spring appears to be here. Which means, like I mentioned here, means it is time to move from our warm, cozy houses OUT into the great outdoors. 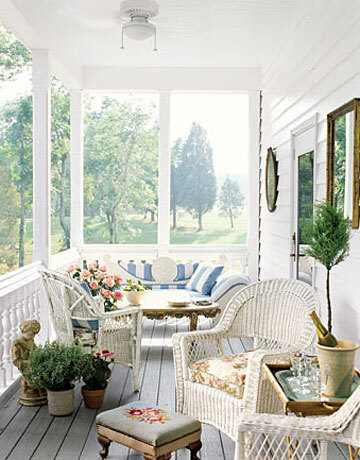 Right now I have porches on my mind. Lazy ones. And pretty ones. So that`s what I am going to muse on hereafter. My porch is in such bad shape- there are no words. It really hasn`t been touched since we bought this place. Except for the one time, last fall, when I broomed it as best I could- which was hard because the porch is peeling so bad all I did was make more crumbles, the more I broomed it. Let`s just say I can`t wait to take my dad`s sander to this rebellious little porch floor. I will teach it ALL ABOUT AUTHORITY. A little off the subject but i thought a few of you (1 or 2) might have interest in the freezer paper words on the front door. 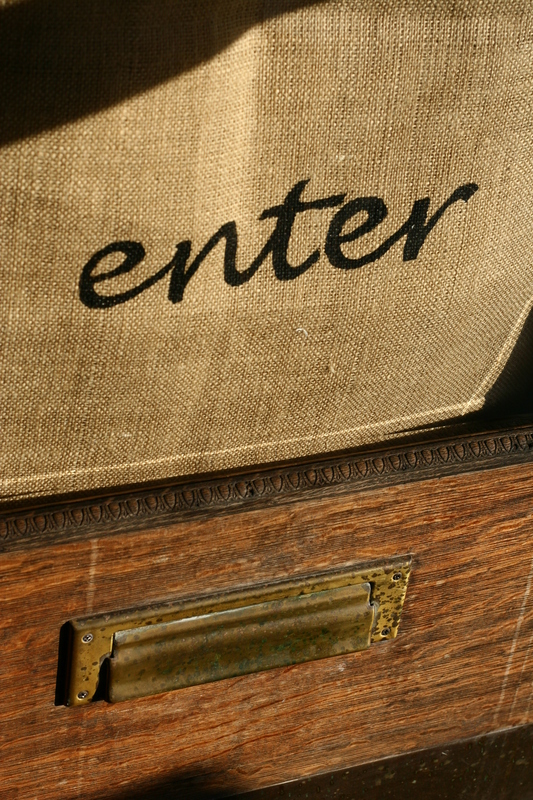 Was fun and I admit, with the depressingness (stop making red squiggles under the word depressingnes, spell checker) of my front porch, it brightens my day to see the little words “enter”– and how much I like them in the midst of utter chaos. The inside says, “depart”, all in lower case of course- because I like that so much. But in hind sight, it could have been the pink that scared them more. I just ran outside 20 min ago, to take this picture, while still wearing my pajamas. Feel the love, people. Was my hair combed? H-E double hockey sticks, no! Please don`t miss the classy Walmart bag floating by the road there. EVIDENCE. How would you like to try and sweep this bad boy? Red pillows must go. They hurt my eyes and don`t scream “lazy” at all. In fact, when I see red, I think, WORK! WELL, WHY ARE YOU STILL SITTING THERE DRINKING AN ICED TEA AND LOOKING AT YOUR NEIGHBOR`S YARD? I AM RED AND I SCREAM GO! Now white is more soothing, I think. And a lot more accepting of lounging on chairs and wasting time. Yeah, it`s white. But how soothed do you really feel looking at this picture? No, those chairs need to be re-primed, re-painted and the Christmas trees might need to retire to their ‘summer home’ in the attic. Have you ever been innocently browsing in a mag… and came across a picture that was like a backrub, and a kiss from a newborn all at the same time? Well, that`s how this picture made me feel. I found it in Country Living— and promptly ripped it out, kissed it, and hung it up to soak up for days after. And yes, what kind of loser takes a picture of a picture. Well, a cool one of course. Reasons I love this and want exactly this for my porch. 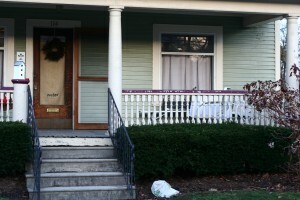 -The shape of the porch reminds me SO much of mine. Although that`s where the similarity ends. – I HAVE those chairs! All I have to do it give them another coat of white paint. 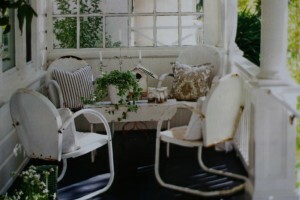 – Can you see the white, wispy, curtain they have hanging there to the right? 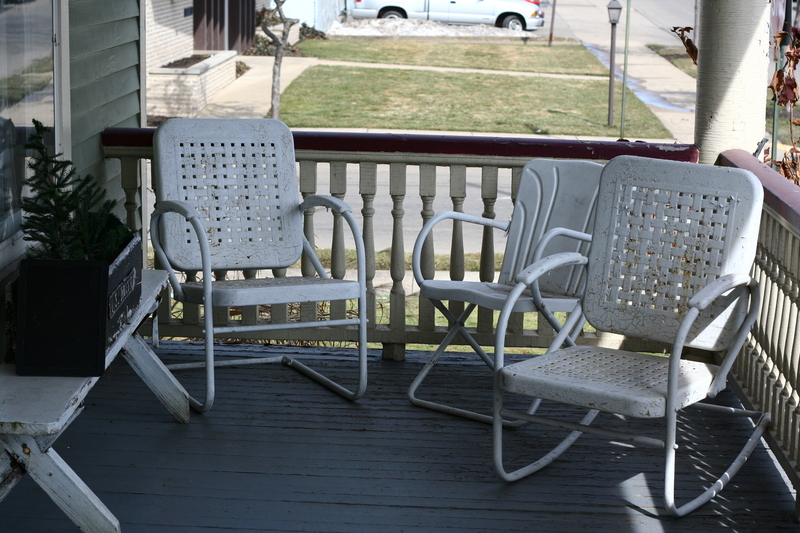 Perfect for when you live in town, and you just want a little exclusion for when you`re sitting on the porch, eating a meal with close friends. And I like that they are wispy, and seemingly innocent. 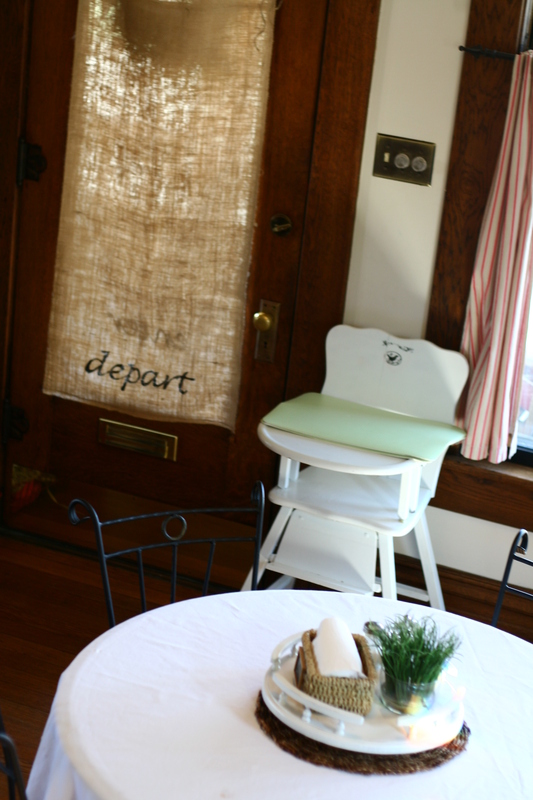 It might be unfriendly to say– hang a big, cardboard, divider board. -I like the understated plants and their placement. They look welcoming, with out being cluttering. 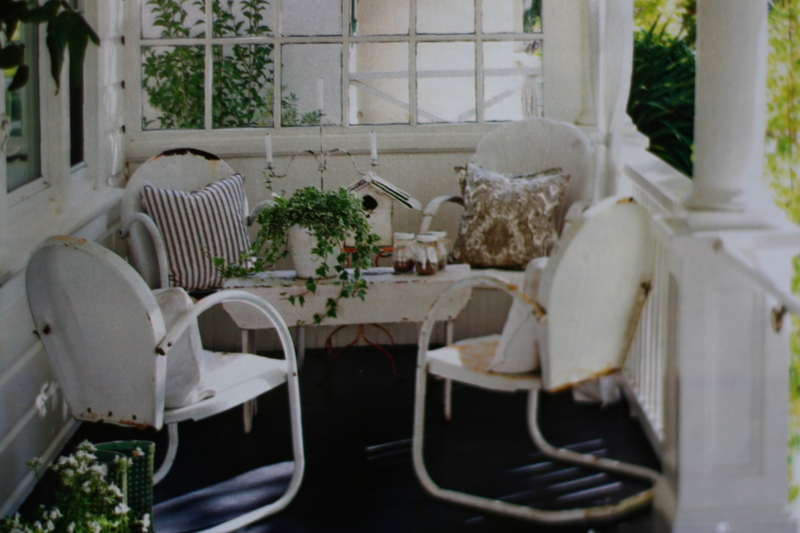 – I have 3 benches like that one and actually since I saw this picture- I took one out of my basement junk room and painted it white. 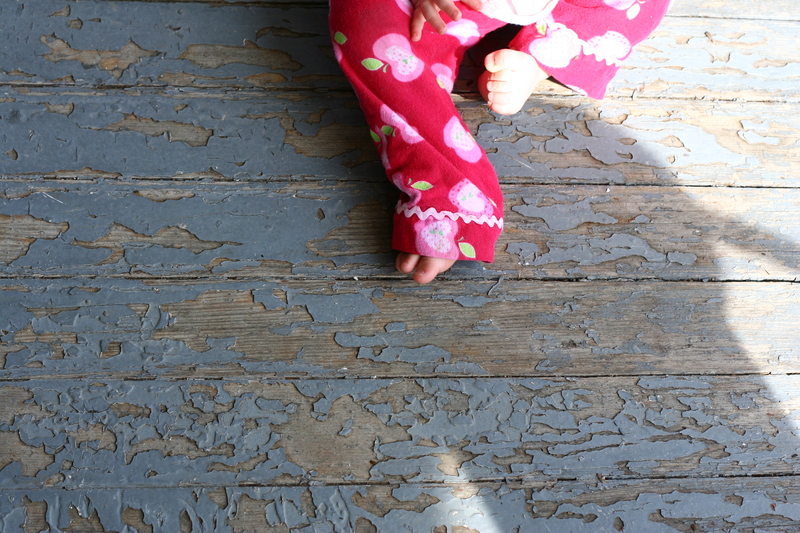 (It has been paint splattered and had a new dried on bird droppings from being outside at our other house. I am very pleased with my bench. I might put wording on mine though. I have never seen this done, but I think it would look really cool to have a Bible reference decal-ed on it. No verse just the reference. Kinda abstract in a classy way? I`m gonna try it. IF I can find the right decal. Or I might make it. 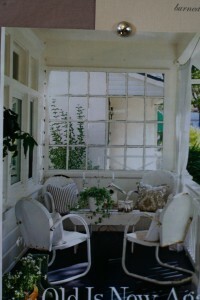 -I love the whiteness of the house/porch. We are painting our house in the near future, but we have not much idea what color we will paint it yet?It might not necessarily be white, like the picture. Any ideas on paint colors? for houses? – I really like that lattice type divider in the background. I don`t have that exact crisscross looking wood stuff- but there is something in my basement that could be painted to go vaguely with this idea. 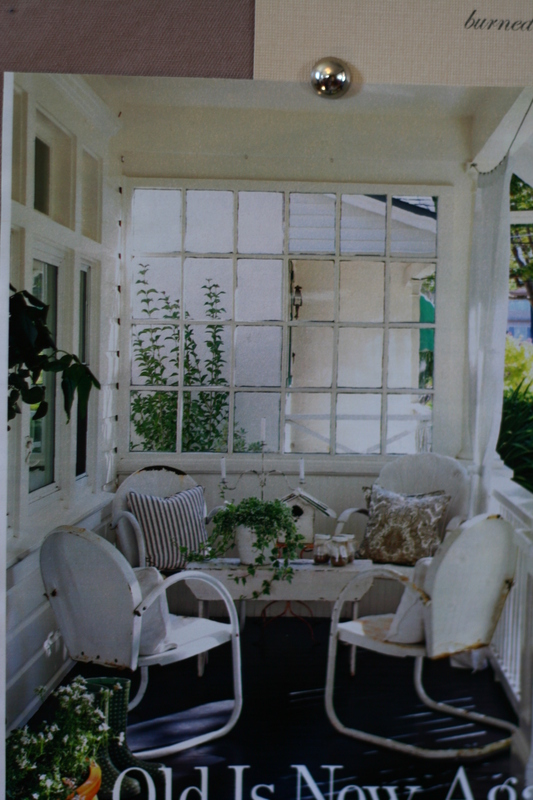 A few other porches I think are REALLY pretty. I DO love the red in this picture. Very bright, cool and energetic looking. This one is from Country Living too. Loving the airy curtains. They add such a sense of coolness and romance. And also the greenery, especially the little tree. Of course the wine and little glasses are eye fetching too. Can we just say breezy and breathtaking? Not a porch, but HOW could I not include this picture? For some really pretty, foreign, spring eye candy go to This Is Glamorous. So WHERE are the “After” pics of my front porch? Well, that is what I will be working on this weekend. 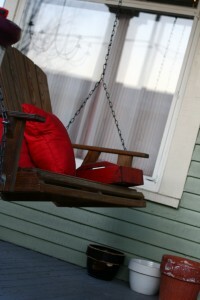 Did I mention my porch has to re-vamped all while spending not one dollar? The goal at least. Well, my babies are wake-y now. I`m off to run errands, borrow the sander, and get back, sand, and then get ready to put in a ‘little fun’ time for the weekend tonight. PS. Can really express how helpful and fun your comments on the gardening advice was!!!! I give you my thankfulness and love. love all the porch pics! Cant wait to work on mine either! I hav big plans for my patio out back this summer. 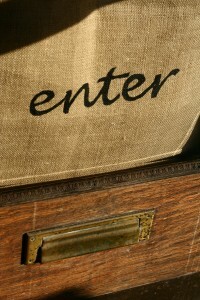 Love the enter on the curtain idea too. We should run to canton and go to the joanns up there they have awesome fabric for pillow right now you could use on your red ones. I could spend hrs in there. oh shelly lets GO! i could spend hours in there too! we should go some night next week and leave the kids with husbands, and just quick go to like, joanns and target. fun! I love the Bible reference idea. Way cool. If that porch floor were mine I would just keep sweeping and sweeping and sweeping and sweeping and vacuum it and sweep it some more. Soon enough you would have that very worn patina and I thrill at the thought. 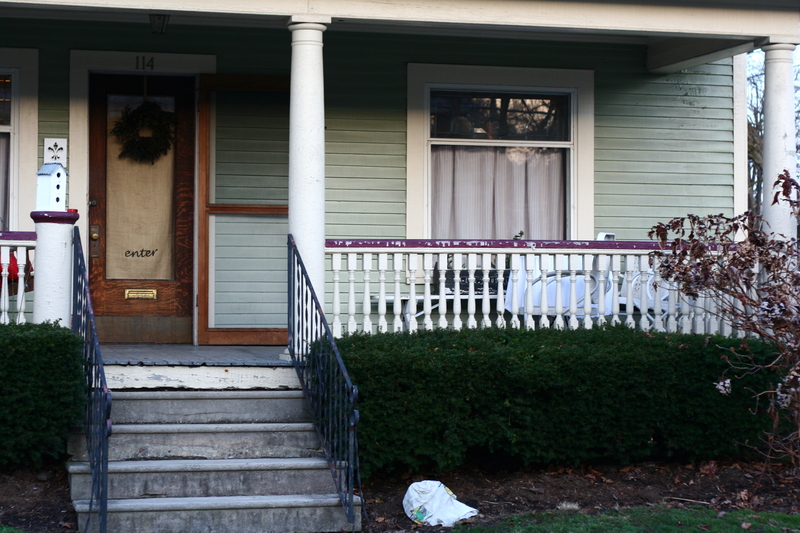 Kind of makes me sad that my porch on my new house will not be painted… I know, that is dorky, but it’s true. Never underestimate what you could find in clearance for curtain fabric. There is often sheer-ish wispy stuff for pretty cheap that would be perfect! 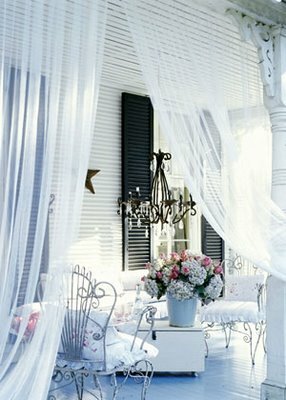 LOVE all the porch ideas!!! Oyr new old house has a big front porch too, but honestly, I’ve been thinking interior stuff so much that outside has hardly been given any thought, poor thing. That was SO NICE you had the winter inside to focus on making that cozy, because it looks a little overwhelming to me to move in in May and have both interior and exterior to do. Arrggghh. So, no helpful tips from me because I’m in the same boat – scoring mags and ripping pages of All Cool Ideas Found and hoping to somehow combine them into a bit of coziness for ourselves. Someday. if you see me drive by REAL SLOW…i am just checking out that cool front porch:)…and i still like red because ..just because ..maybe it’s cause i need to work instead of driving past restful porches…red more reds ..ahhh then the whites and greens but the pinks will remain on your porch! my living room is mainly red and i l love the energy of it. 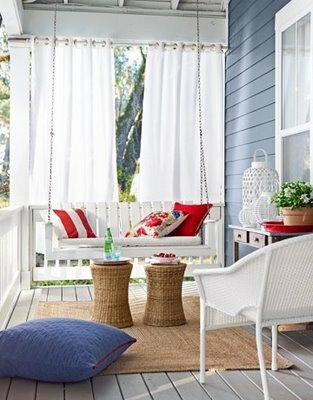 This makes me want to redo our screened in porch all over again! I love the light colors! Happy sanding!! Can’t wait to see your after pics! Fabulous fabric for porch curtains… I found a wealth of decent wispy porchy curtainy stuff at none other than Wally World the other day. I know you said no money but… I’m just saying. Does anyone want to go fabric shopping in LA with me?? 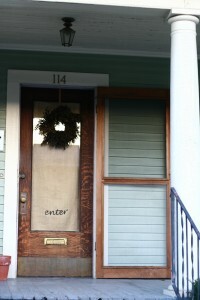 I can hardly wait to see your porch pictures! Wish i had more TIME at home to do projects!